Mundos Alternos brings together the work of international artists from across Latin America with Latinx artists from throughout the United States: ADÁL, AZTLÁN Dance Company, Guillermo Bert, Erica Bohm, Tania Candiani, Beatriz Cortez, Claudio Dicochea, Faivovich & Goldberg, Sofía Gallisá Muriente, Guillermo Gómez-Peña, Hector Hernandez, Gyula Kosice, LA VATOCOSMICO c-s, Robert “Cyclona” Legorreta, Chico MacMurtrie / Amorphic Robot Works, Marion Martinez, MASA—MeChicano Alliance of Space Artists (Luis Valderas and Paul Karam, with Sergio Hernández, Debora Kuetzpal Vasquez, Miguel Luciano, Laura Molina, Tony Ortega, and Raúl Servín), Jillian Mayer, Mundo Meza, Guadalupe Maravilla, Glexis Novoa, Rubén Ortiz Torres, Rigo 23, Alex Rivera, Clarissa Tossin, Carmelita Tropicana, Luis Valderas, Ricardo Valverde, and José Luis Vargas. Representing a region that is home to vast immigrant populations from Latin America and a vibrant art scene sustained by Latinx artists locally and internationally, the Queens Museum presents the East Coast reiteration of the exhibition. This exhibition and programming will reflect on New York’s cultural and geopolitical ties to the Caribbean and South and Central Americas. 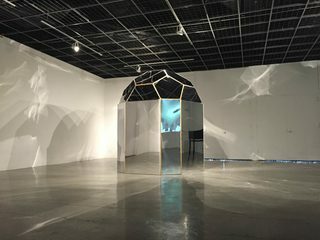 The exhibition is organized into thematic “constellations” including Cornerstones, Time Travel, Alternate Americas, Indigenous Futurisms, Reimagining the Americas, and Alien Skins. For this iteration, Mundos Alternos dynamically expands its interface with satellite installations and programs at partner institutions throughout New York City: The Leslie-Lohman Museum of Gay and Lesbian Art will exhibit the section Alien Skins; the Museum of the Moving Image will present a film screening series and lectures organized by Mexico City-based guest scholar, Itala Schmelz; and Sugar Hill Children’s Museum of Art & Storytelling, Harlem will organize a series of special programming for family audiences. A series of performances, talks, readings, and workshops will be presented to examine the far-reaching influence of science and speculative fiction in the Americas and beyond. Programming will center on contributions from artists, writers, poets, and musicians that engage “futurisms” from a wide range of perspectives covering geo-political, social, environmental, and personal themes. This exhibition is organized by UCR ARTSblock, and curated by Robb Hernández, Tyler Stallings, and Joanna Szupinska-Myers. Major support for the exhibition was provided through grants from the Getty Foundation. The exhibition was part of the Getty’s Pacific Standard Time: LA/LA initiative. Major funding for the Queens Museum is generously provided by the New York City Department of Cultural Affairs, the New York State Council on the Arts with the support of Governor Andrew Cuomo and the New York State Legislature, the Lambent Foundation, the Booth Ferris Foundation, the Lily Auchincloss Foundation, Inc., and the Laurie M. Tisch Illumination Fund.